The RELIEF Centre launches its first MOOC: "Community Based Research: Getting Started"
Researchers from the Future Education research team of the RELIEF Centre have launched their first MOOC: "Community Based Research: Getting Started"
Researchers from the RELIEF Centre have released their first MOOC, "Community Based Research: Getting Started" on the Future Learn platform. Registration is now open for this course, which will begin on 25th February 2019 and is free. Register here. 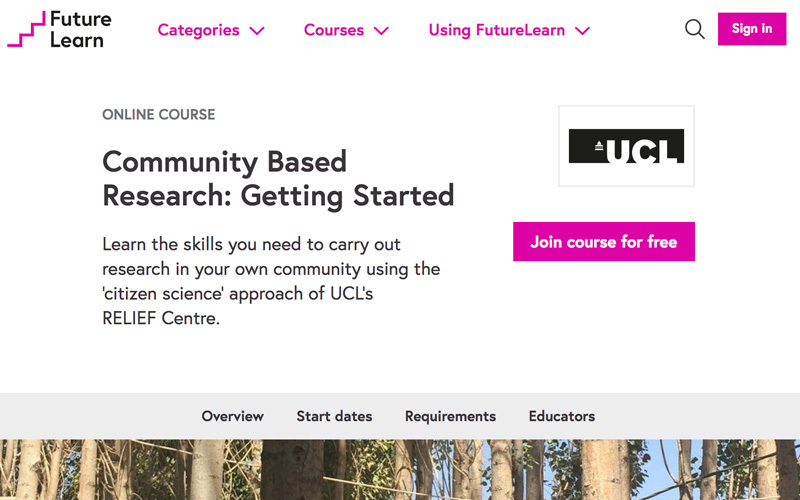 "Community Based Research: Getting Started"
This MOOC features the citizen science methodology used by the RELIEF Centre in Lebanon. It teaches the basics of community based research using this methodology, leading learners to construct their own research questions to find out community needs and how to meet them. Participants of the course will come away with research skills that will enable them to carry out local research projects sensitively and ethically, using examples from Lebanon. Community based research is done by, with and for the community. It aims to give local people the power to understand and change their circumstances. This kind of research investigates what it takes to meet the needs and goals of the community. It is small scale and local, and carried out by people who are not necessarily trained researchers, but who one day might be. The MOOC takes you through all the stages of a community-based project. It uses examples showing how people in some of the most challenging community environments have changed the conditions of their daily lives. Undertaking a MOOC is a social-learning process: first you watch the videos, which give you a window into other communities, then you join the discussion and exchange ideas with other participants. Participants' contribution of ideas and examples then enable all on the course to learn from each other. The course requires around three hours of study a week over three weeks and only requires a computer or mobile device to complete. Once you sign up for the course you are free to use the resources yourself for your own professional development courses, enabling you to support your own communities to start up their own projects. This MOOC is for community members who want to find new solutions for community problems. It's also suitable for community researchers recruited by NGOs, teachers who want to investigate relationships between school and the community, academic researchers in Lebanon and elsewhere, students wanting to carry out community resesarch, leaders of community research, trainers of researchers in NGOs or on academic projects, and even entrepreneurs who wish to investigate the community demand for their products or find out what the community needs. The RELIEF Centre is a transdisciplinary research collaboration that focuses on one of the world's pressing challenges of the moment: how to build a prosperous and inclusive future for communities affected by mass displacement. The RELIEF Centre's research focuses on how we can measure prosperity and growth in Lebanon, moving beyond indices like GDP to include measures of wellbeing, health, employment and education. It is led by the Institute for Global Prosperity at UCL, in collaboration with departments in University College London, American University of Beirut and the Centre for Lebanese Studies. The Future Education team works on co-designing the appropriate education and learning opportunities for communities impacted by mass displacement. This research theme works with local academics, policy makers, teachers, teacher-educators and community members to design and embed scaled up online and blended learning to address pressing educational and training needs.